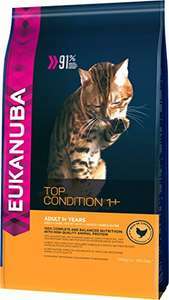 Following on from my previous post regarding Applaws cat food with 80% protein and cats only able to digest protein; unlike dogs that can eat almost everything. That you would spend more on cheaper cat foods such as the big brands you see on TV as they require more to fulfill their appetite. £51.70 for 10 kilos - 166 days worth of food for the average cat. muscles in a way that no vegetable protein would ever achieve. support your cat in feeling extraordinary and looking magnificent. * Out of total protein level. Wow nice find. I feed my kittens the Applaws Chicken Kitten and they love it. Not heard of this brand. Wow nice find. I feed my kittens the Applaws Chicken Kitten and they love …Wow nice find. I feed my kittens the Applaws Chicken Kitten and they love it. Not heard of this brand. Fed my cats cheap biscuits and normal pouches and the vet thinks they are super healthy. my cats hate dry food. you worry about your cats diet but feed them overpriced biscuits! Many first-time cat owners, in an attempt to hold down expenses, buy the cheapest foods they can find for their cats. This is a false economy for a couple of reasons. First, studies have shown that cats eat as much as they need to get the nutrients they require. Therefore, they might eat twice as much of that generously-carbohydrate-filled store brand to get the nutrients they need in a normal feeding of premium food. Second, the continued feeding of substandard foods over a period of years will heavily contribute to, or even cause, serious medical conditions that will require expensive veterinary care. For these reasons, the old maxim, "You get what you pay for," is particularly true where it comes to cat food. Once considered the panacea for feline nutrition, new evidence shows dry foods may be a source of chronic health issues. Urinary, arthritis, kidney, diabetes, and even dental problems are just a few of the diseases now associated with dry food diets. Water matters and is most bioavailable and beneficial in food. Moisture rich foods offer critical support to electrolyte and micronutrient balance, maintaining cellular integrity throughout the body. Quality canned, raw, and well-balanced home-made foods offer higher meat proteins, fewer carbohydrates, proper moisture levels, and fewer highly-processed ingredients, mimicking a more natural diet. Many first-time cat owners, in an attempt to hold down expenses, buy the …Many first-time cat owners, in an attempt to hold down expenses, buy the cheapest foods they can find for their cats. This is a false economy for a couple of reasons.First, studies have shown that cats eat as much as they need to get the nutrients they require. Therefore, they might eat twice as much of that generously-carbohydrate-filled store brand to get the nutrients they need in a normal feeding of premium food.Second, the continued feeding of substandard foods over a period of years will heavily contribute to, or even cause, serious medical conditions that will require expensive veterinary care. For these reasons, the old maxim, "You get what you pay for," is particularly true where it comes to cat food. My first ever cat was fed standard food and had no illnesses or vet bills other than standard injections and lived to 17 years old. Next couple lasted 16 and 17 years old. Current two are only a few years old but both super healthy and no illnesses. So not had many concerns on quality of food. My first ever cat was fed standard food and had no illnesses or vet bills …My first ever cat was fed standard food and had no illnesses or vet bills other than standard injections and lived to 17 years old. Next couple lasted 16 and 17 years old.Current two are only a few years old but both super healthy and no illnesses. So not had many concerns on quality of food. Your comment is no different to people who smoke 40 a day and somehow live until they're 95! Of course diet matters to your cat's health, it matters to ours so why feed your cats derivatives which contain all sorts of rubbish - please research what can go in to derivatives. Zooplus sell a wide range of quality foods for your cat that work out cheaper than the likes of Felix, Whiskas etc and your giving your carnivore (!) real meat. Taste is not bad dry, good snack mix as source of cheap protein. 10kg bag will last for my cat life time. She's not keen on dry food.